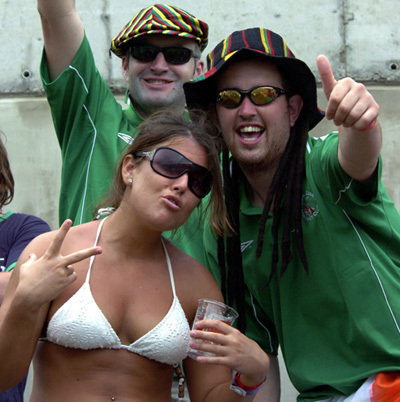 Irish supporters in high spirits during their team's match against the Windies at Sabina Park on Friday. The West Indies won the match. Caption: Bob Marley and Britney Spears seen here in happier times. Caption: We are the new I-threes! Caption: One..No, two more rum punch! Caption: W.I. may have won but Jamaica was the \'Bomb\'. Caption: Two I have only two!....You\'ve been drinking too much Rum if you see three. Caption: Having a great time mon. Caption: Big up IRIE-land mon! Thank you for the 120 responses we received. Enter again and we hope you will be the outright winner next time.